"Trails Solutions Selected to Design Trails at Mammoth Resort"
IMBA's Trail Solutions has been selected as the consultant for natural-surface trails at Mammoth resort. Professionals on the Trail Solutions team will work closely with ALTA Planning and Design, who is providing planning services for paved pathways and road systems. According to IMBA's Cimarron Chacon, Mammoth has plans to become a "premier year-round resort community." The planning includes a multi-jurisdictional partnership with the town of Mammoth Lakes and the US Forest Service. Additional partners include Mammoth Mountain resort and the MLTPA, a local non-profit." 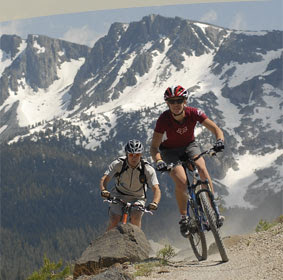 access for Mammoth Lakes and the surrounding region." Survey Here's a Trail-Use survey for the Town of Mammoth Lakes. You can tell them that you like to mountain bike and want more singletrack opened up! The photos above are from the Mammoth Mountain Bike Park website here.